Magic lingers inside all who call Cagair Castle home. Only pain comes to him when he sleeps. His dreams give him glimpses of all he can't remember when awake. His name and memories are lost to him in a way that leaves him troubled and wanting. Then the opportunity for a new life places him in the path of a lass who seems to already know him. Could she be the key to helping him remember? Bethany was able to save a faithful friend from a certain death, just one problem he can't remember his name or where he belongs. Gillian keeps dreaming of a man. She lives present time and her man lives in past. Can these two ever get together. Bethany knows how to bring you into the story and make you fall in love with characters. Lily does a good job in narrating the story line. She gives us insight on how to pronounce some of these names. I love all of the books in this series that I have read so far. Looking forward to reading the rest! This was a nice story of time travel. I enjoyed it. Great series - awesome story just wish it wasn't so short. I actually lost money using a credit on this one. shorter books should be cheaper. A definite yes after book 5’s sadness. This is book 6 in the series so make sure to read the first 5+ ones before starting this one. Gillian has claimed ownership of Cagair castle (in the present) after Jane’s mysterious disappearance and has set about renovating the castle to its full glory. Until her world is turned upside down by a group of strangers renting the castle for a few days for an obscene amount of money. Her guests seem odd and when she finds a dirty ragged man wandering the mist, she doesn’t think life can get any weirder. But then she learns to time travel. Orick disappeared over a cliff to plunge into the sea and to his death, the trouble is… he doesn’t know who he is or where he’s from. What he does know is Gillian is the fairest woman he’s ever seen and wants to get to know her better. After the sadness that soaked the pages of book 5, this story was one of hope and finding your way out of self-imposed darkness. Gillian is a strong character with a good moral compass and a deep internal flaw she must overcome in order to survive and thrive. Their romance was one of sweet moments and respecting personal boundaries that was wholesome to read. Lily Collingwood is, as always, enjoyable to hear. The book was 6 hours as usual, the recording quality was excellent with no hum or distortion and made the entire focus on the story. Love Beyond Dreams continues where Love Beyond Compare left off. Orick was fallen into the sea and the MacCristy clan believing him dead, has been in mourning. Gillian Wright has been castle-sitting for her sister Tracy and has been dreaming about a mysterious man that only appear while she sleeping. Orick has been rescued by Marilyn, a hermit who has been wandering from one place to another place. He doesn't remember his past or his name. When Orick accidentally stumbled into the present, Gillian found him roaming around the Cagair Castle in present day. It is a question of whether Orick's memory will return and if Orick the man of Gillian's dream. What I like about this story is for the past five books, everybody wanted to stay in the past. This story allows the two characters the choice to stay in the present and to safeguard gateway between the 17th century and the present. Another is that Gillian has been hurt in the past and refused to be emotionally available in any relationship. She isn't willing to risk her heart to find love and happiness. If the readers/listeners have read Love Beyond Compare, they will know that Orick has a special skill of bringing the best out of people. Even though Orick may have suffered a tragedy in his past, he wasn't willing to let that part of him dictates how he live in the present and determine what his future will be. The narrator, Lily Collingwood does a wonderful job of narrating the story. I'm glad that the narrator has came back to narrate for this series. I was given this audiobook by the author in exchange for an honest review. I was not compensated or influenced in any way for writing this review. continuing the story of love and time travel, Bethany keeps the story lively and wonderfully fresh. Hearing the story makes it truly come to life. Gillian and Orick's story is spicy and exciting. Travel through time with them! Lily Collingwood is an excellent narrator! These books just keep getting better!!!!! What did you love best about Love Beyond Dreams? I loved the Chemistry between the two main characters, Gillian and Orick, especially when they finally came together. She dreams of him everynight and when they finally meet the chemisty is just, well, WOW. It was also great seeing some of the characters from previous books. What other book might you compare Love Beyond Dreams to and why? I wouldn't compare this series to any other as they stand out on their own. I loved the story from the start to finish, all the books in this series have moved me as such, I can't wait for the next one. This is a great continuation of this brilliant series and can't wait for the next audiobook to come out. This was story was of Gillian and Orick. Gillian, who constantly dreamt of a handsome Scotsman. Orick, a man who was literally trying to find himself. The chemistry between these two when they finally come together is off the charts. I knew a hooy ending would bev in store for them despite the issues they faced. It was good to see some of the characters from the previous books such as Callum, the ever precocious Cooper, Morna. These books never get stale for me. Each one is an exciting ride. And as a reader, I enjoy riding into the past and back into the present with the characters. 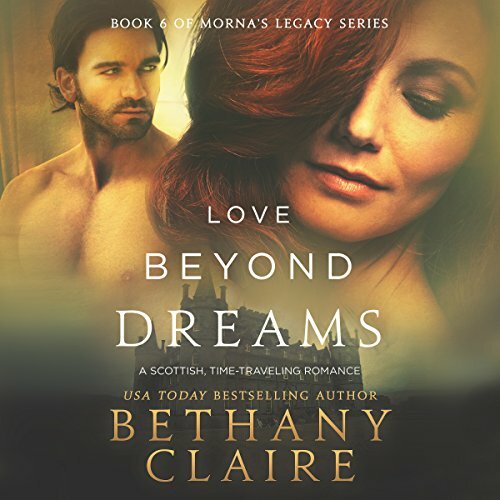 This is a great book; this is the sixth book in the Morna’s Legacy series and is written by Bethany Claire and narrated by Lily Collingwood. This is a great time traveling romance. Gillian Wright dreams of the same man every night - his kind eyes and gentle smile as familiar to her now as her own reflection. She looks forward to her nights spent with him, but when she starts to hear his voice in the winds around Cagair Castle, she can't help but wonder if he's more than a figment of her imagination. The narrator Lily Collingwood did a wonderful job with this book. She did a great job with the different voices of each character in this book. It was very easy to listen to in one sitting and I didn’t want to stop listening until the end.